There is a certain amount of luck playing the game. But if you can get past the 7th level then you should win fine. Here is a youtube video of the last level. 1. Build towers in the center so your towers can deal with the fast cars first and later the slow cars. 2. When the upgrade cost much more than a building another different type of thug. purchase that thug. 3. Its best to switch to machine gun thug as they are able to attack fast, and creeps provide little money. 4. Use TNT to slow enemies down, while you are trying to earn additional cash for upgrades. 5. Take advantage of the corner of the building to gain maximum attacking range. 6. Its best to have a higher level thug than many lower level thug. 7. 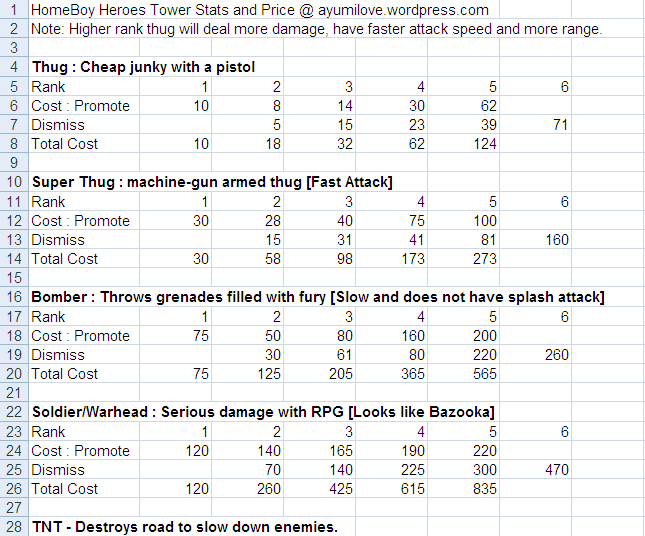 As thug increases rank, they also increases their attacking range, attacking speed and damage. There’s no reason to spread out your firepower at the start like this walkthrough suggests. In fact, following this walkthrough require unnecessarily precise placement for it to work - you have to get the locations of your turrets exactly where they are shown, or this strategy simply won’t work. A much sounder method is to place your first machine gunner right on the upper-right corner, as close to the corner as possible. The build order suggested is pretty good, though. Your first guy should be a machine gunner, then you should upgrade him once, then buy another, then upgrade him once, then lay down a TNT blast. As I said, though, there’s just no reason to spread out your firepower. Every enemy on this level has to pass the upper-right corner, so concentrate everything there, only expanding down the right side after you’ve got at least three once-upgraded machine gunners on the corner. I’d put the second one just to the LEFT (as close as you can) of the corner one, as this will make losing only one life on the third wave much easier. After that, though, all gunners should be placed below this corner, working down the right side. Also, there’s no reason to buy a grenadier, as the walkthrough suggests - just keep buying machine gunners, and expanding your TNT coverage as needed. Just remember to always upgrade a machine gunner once before you buy the next one - it’s worth it. Once you hit the seventh or eighth wave, you’ll probably want to start building some gunners across the street to take advantage of the TNT you’ve already laid down, which is fine. Once you’ve got seven or more gunners out the level is more or less done, as long as you keep building, but you can relax. Also, this method should let you finish up with four or more lives, rather than the close call the walkthrough forces you into with just one left. Just to sum it up: Start with the upper-right corner, build only machine gunners, upgrading each one just once. Build one just to the left of your initial corner, then start building them straight down the right wall of the central building, blasting the street with TNT as you go. (Also, you don’t have to place your TNT blasts as close as the walkthrough suggests, doing so is a bit of a waste, as they’re overlapping.